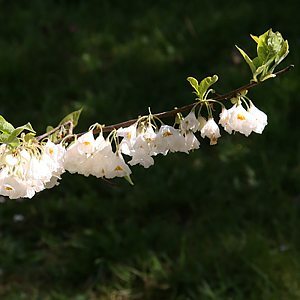 Best known as the ‘Snowdrop Tree’, Halesia are small trees that have spectacular flowers in spring. Used in landscaping as feature trees, a number of varieties are available from wholesale growers in Australia. This is not a tree that is found in many nurseries, and its certainly not because of the flowers, although they are small. Its also not because of pests and diseases, because it does not really have any problems with these. Halesoa monticola (syn Halesia tetraptera) will reach around 5 – 7 m in height and with masses of white flowers is an excellent spring flowering tree for a medium to large garden. Long lived and with attractive bell shaped white flowers in spring Halesia carolina grows well in well drained a humus rich moist soil with protection from hot afternoon sun. Well drained and moisture retentive, so mulch to maintain moisture.